missionary strength for ten years. Orthodox and Coptic nations cannot convert to Protestantism, Anglicanism or Reformed, but Orthodox nations have the mission to Restore the Pentarchy, which upon completion will remove the Papacy from the game, thus disabling Excommunication, Crusades, and the college of Cardinals. cardinals will be appointed to vacant seats on the first day of every year. These are allocated semi-randomly among Catholic nations, favouring higher development provinces and nations with more total development. papal influence, and so on. The Papal State does not accumulate papal influence, but automatically gains invested influence based on the number of Cardinals in existence. When the current Pope dies, each Catholic nation has a chance of becoming the next Papal Controller equal to the ratio of their invested influence to the total invested influence of all Catholic nations (this total includes invested influence accrued ex nihilo by the Papal State). centre of reformation. The first two nations that convert to Protestantism will also get a centre of reformation in a random province. These centres of reformation convert nearby non-Protestant Christian provinces to Protestant, much like a missionary but with 5% extra conversion strength, in a maximum range of 150. A centre of reformation can only be removed by converting the province to a religion other than Protestantism, but this is very difficult as they have a -5% local missionary strength modifier. patriarch authority. Events will periodically pop up enabling you to increase or decrease the authority and prestige of your autocephalous patriarchate. Patriarch authority is not shared between all Orthodox nations in the way that reform desire is shared among all Catholics; each Orthodox nation has its own patriarch authority (thus, for example, Muscovy's decisions will not affect Byzantium's patriarch authority). This reflects the autocephaly of the Orthodox church. Makuria gets an event that gives a province modifier to Qasr Ibrim that makes it easier to convert the province to Coptic Orthodoxy. ducats equal to 0.25 years of income. Local missionary strength modifiers, a −XY% value means that the province is harder to convert, while a +XY% value means it is easier to convert. diplomatic relations with other Muslim nations. Ibadi nations are more flexible, with access to both Sunni and Shiia Schools. Karma slider. Positive karma is mostly gained from releasing nations and returning cores, which uniquely never costs diplomatic power cost for Buddhist countries, and honoring military alliances. Negative karma is incurred from declaring wars and taking provinces for yourself (unfortunately making it essentially impossible to keep karma neutral as an expansionist nation). The ruler of a nation with strongly positive karma will gain a small buff to diplomatic reputation. A ruler of a nation with strongly negative karma will gain a small buff to discipline. Neutral karma gives a stronger buff to both discipline and diplomatic reputation. Moral Guidance in an Era of Turmoil. The Wokou Pirates and the Bahan Trade. Wealth of Nations DLC, Hindu rulers are allowed to pick their deity through the Religion screen. This choice lasts for the life of the ruler or until an event changes it. All Hindu rulers have unique special event paths that allow them to improve the ruler's base Monarch power generation as well as other positive effects. 50 Prestige and can be done once every 10 years. Wealth of Nations DLC enabled, Norse rulers are allowed to pick their deity through the religion screen. This choice lasts for the life of the ruler or until an event changes it. A Norse republic chooses a new deity every time a new leader is elected (4–8 years depending on republic type and choice). Such countries can rapidly change their stats to adjust to game circumstances. institutions that the bordering province had. 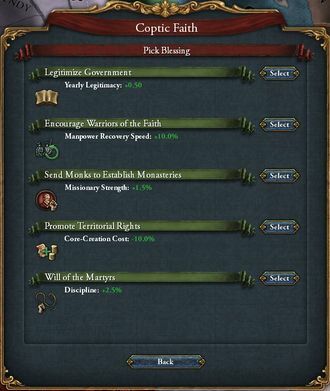 provinces can pass a religious reform, but doing so will remove all their authority and spark a civil war as a pretender exploits the loss of authority to attempt to seize the throne for themselves. After all, every reformer is challenged if they go too far. If these rebels enforce their demands, two religious reforms are lost, greatly setting back the country's progress towards reforming the religion. Feudalism, it will be able to reform the religion, getting 80% of the neighbor's tech level, all institutions that the neighbor has embraced, and gaining the permanent benefit of the religious reforms. provinces. In the vanilla New World, Mayan countries start with a total of 16 provinces between them, so reforming requires conquest of Nahuatl provinces. Feudalism, it will be able to reform the religion, getting a tech boost and gaining the permanent benefit of the religious reforms. stability drops by 1, and all subject states will declare independence (which creates a one-way truce), forcing the country to go to war to bring them back into the fold. Furthermore, each reform decreases the rate at which the country accumulates Doom by 20% from the base rate. Enacting all five reforms effectively stops Doom from increasing every year, although it can still increase through special events. Feudalism. This brings the country up to 80% of that nation's technology level and it also permanently disables the Doom mechanic.